With the media buzz that is being created with the release of Pope Francis’ new encyclical on the environment titled, Ladauto Si (“Praised Be You”), you would think that the Catholic Church has never said anything before about the environment (also known as Creation). Just as we witnessed with the “buzz” over Francis’ comments about the Big Bang Theory, the media will eat just about anything he says thinking that it’s never been said before, but in reality, most of the things he is saying that focuses on doctrine, has been stated by his predecessors and other documents. 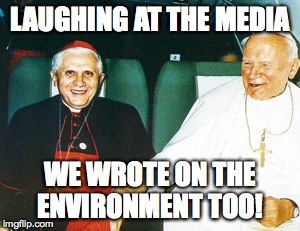 Do you really think that Pope St. John Paul II and Pope Emeritus Benedict XVI never spoke on the environment? If you think this – then you are a complete fool and I have ocean front property for you in Arizona. But in all seriousness, these two great Popes have not only written about the environment but have also spoken about it on occasion as well. In the days ahead, I will draw your attention to some of their quotes on Creation as well point out to you some documents and speeches. With this being said, let’s look at what the Catechism of the Catholic Church teaches on the Visible World (the environment) and Respect for the Integrity of Creation. If you don’t own a copy of the Catechism and you are a Catholic, buy it today! This is where you should be getting Catechesis on our faith. Not from the secular mainstream media, who often report on our teachings falsely and in complete error. God willed the diversity of his creatures and their own particular goodness, their interdependence, and their order. He destined all material creatures for the good of the human race. Man, and through him all creation, is destined for the glory of God [#353]. Respect the laws inscribed in creation and the relations which derive from the nature of things is a principle of wisdom and a foundation for morality [#354]. The dominion granted by the Creator over the mineral, vegetable, and animal resources of the universe cannot be separated from respect for moral obligations, including those toward generations to come [#2456]. Animals are entrusted to man’s stewardship; he must show them kindness. They may be used to serve the just satisfaction of man’s needs [#2457]. For further reading on these points, I would suggest also reading paragraphs 337-349, 2415-2418, and Quick Lessons from the Catechism: Creation of the World. Over the next week or so, you are going to be fed a line of nonsense about what the Holy Father’s document says and doesn’t say from the mainstream media. The primary thing to do is read the document itself. If you are going to read about the document, please get your information from solid Catholic News Sources, such as the National Catholic Register, EWTN, Catholic Vote, Catholic News Agency, or Zenit. They will provide excellent coverage and objective reporting.